Note: These are handsome and delicious puffs! The filling tastes like a vanilla bean pudding - it's great! They are quite easy to prepare, you just need to make sure you allow enough time for the chilling of the filling etc. A pastry bag is essential for this recipe. Bring whipping cream to a simmer over medium-low, then remove from heat. Add chocolate pieces and stir until smooth and melted. Add more cream if you'd like the sauce thinner. 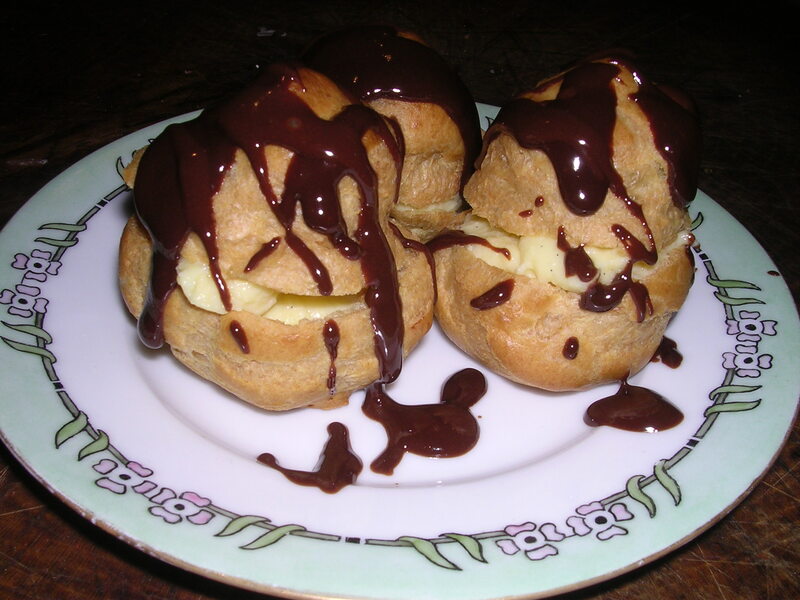 Cut each profiterole in half horizontally begining at the knife piercing. Spoon cream filling (about 1 tablespoon) into the bottom half of each profiterole. Place top puff on. (Can be prepared 8 hours ahead. Cover loosely with plastic wrap and refrigerate.) Place 3 puffs on each plate. Drizzle puffs with warm chocolate sauce. Sprinkle with sifted confectioners sugar (optional).